RS232 To RS485 Data Communication Adapter Features: * Bi-direction RS232-485 converter is mainly used for telecommunication between end to end or end to ends of main electronic controllers. The converter works between the main controller and sub station machine to complete industrial automatic control system, universal card system, access control system, car parking system, Self-served banking system, bus ticketing system, restaurant menu system, personnel attendance system and road toll system, etc. * Easy use, no wire, no tool required. * Without requiring any AC or DC power. * A female DB9 interface allows it to be plugged directly into any one of the PC's Com ports. 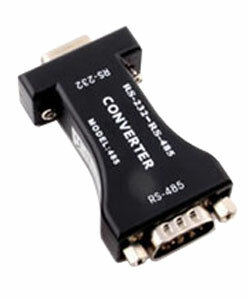 * Convert RS-232 signal to RS-485 signal. * Working Modes: Asynchronous, half-duplex, differential transmission. * Work Environment: -10�C to 85�C, relative humidity 5% to 95%. * Transmission Distance: 1.2 mile (RS-485), 5 meters(RS-232). * Transmission Speed: 300-115200 bps. * Transmission Media: Common wire, doule wire, UTP or Shielding Line. * Serial Port Feature: Compatible with EIA/TIA RS-232C standard and RS-485 standard. * Electronic Interface: At the side of RS-232 is a DB9 female (hole-type) connector. * At the side of RS-485 is a DB9 male (needle-type) connector, with connection board. * Signals: RS-232: TXD, RXD, RTS, CTS, DTR, DSR, DCD, CND / RS-485: Date+, Date-, GND.